Just a few things I wanted to mention at this time. 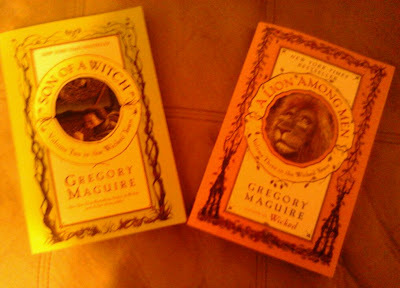 I had lent to me the next two books in the Wicked series (from the same friend who lent me the first book). My friend has her own library, which is a dream of mine, and has an interest in a lot of the same books as I do, so it works out well for me I guess. There are four books total in the series. I've had a slow start to begin reading them but plan to dedicate more time to them in the near future. What I've read so far falls in line pretty well with the first book and has that same sort of shock value that I think Maguire goes for. This a picture, of course, that I took of the two books. I also want to mention a lovely website from which I have ordered some things lately. The website is called Notnu... a play on not new. The web address is notnushop.com. I would describe it as an online thrift store, in mentioing it by word of mouth to a few people already, those were my exact words. Some words used on the site to describe it are formerly loved, vintage and handmade. At any rate, it is certainly a nice second hand store and it makes me feel good to support a small business, save money, and recycle. She made a handwritten side note inside the package to thank me for being a repeat customer as well, so all was very well and good and I am very pleased to have found such a site.